Look at the poor little bun, crushed under the weight of carmelized onions, bacon, quail egg and — let’s not forget — a big hunk of beef. Oh yeah, and cheese. Seeing what’s happened to its bottom, the top of the bun refuses to get involved with this burger. My wife and I were in London not long ago. My parents (this will become a nebulous term the longer you read this site) are unadventurous eaters. They took us to this place near Old Bond Street called the Automat. The restaurant bills itself as an American Brasserie. It is always fun to see our cuisine (my wife and I are Americans) translated back to us. The most remarkable aspect of the meal to me was the Automat’s breakfast burger, which I ordered. 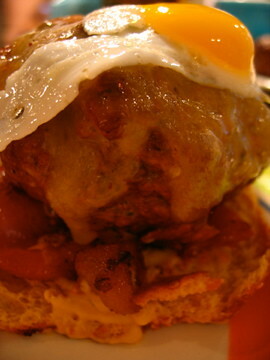 The burger was so large, piled with very interesting meats and an egg, that I barely finished it. So this burger is a translation of a translation back to its native tongue. Let me know what you think. You are currently browsing the archives for the Burger category.